Garlic is a Cool Season Vegetable from the Onion Family (Allium sativum var. sativum and ophiosco from Alliaceae Family). Not native to North America. Easy to grow and productive - a pound of cloves can produce 7 to 10 pounds of garlic. The “stinking rose” needs rich, well-drained soil, and full sun. 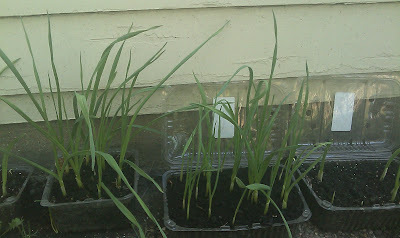 Garlic grown in recycled plastic fruit boxes from Costco. 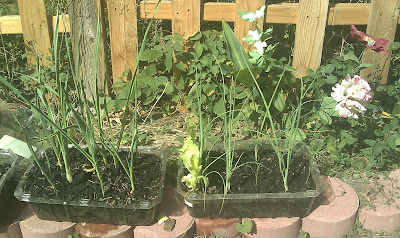 Garlic prefers cool weather when developing foliage, and warm weather when bulbs enlarge. Fall plantings take about 8 months to mature. Raised beds are ideal. Plant from about the time of first fall frost to early November. Using cloves from the supermarket is not recommended. They may carry diseases or have been treated to discourage sprouting. Purchase bulbs from mail order suppliers, garden center, or other local source. Break bulbs apart at planting time, keeping papery husks on the individual cloves. Plant with tips up, 2 inches deep and 4 to 6 inches apart in rows 15 to 24 inches apart. - Softneck varieties (Allium sativum var. sativum): So called because their necks stay soft at harvest time, so they can be braided. Produces large cloves around the outside, and smaller cloves in the middle. Strong flavor. Stores well. Less winter-hardy than stiffnecked varieties. Varieties found in supermarkets are most often softnecks. Includes Silverskin and Artichoke types. - Elephant, or great-headed garlic (Allium ampeloprasum): Milder flavor, intermediate between garlic and onions. Larger bulb with fewer larger cloves (usually about four). More closely related to leeks than to A. sativum garlics.